Beautiful modern 2016 home with bamboo flooring, updated bathrooms and all new appliances/furnishings. Come and relax on any of the three spectacular decks overlooking both the lagoon and the natural wildlife preserve. Lounge by the water or have dinner and cocktails on the fully furnished deck complete with gas grill. Plenty of living space ... sleeps six comfortably in bedrooms. Accommodations include 2 full baths and an outdoor shower. Property comes with bulkhead and water access for boats, jet skis, or any other water toys that can provide water sports fun for the entire family. Long Beach Island beaches are 5 minutes away. This is perfect for families, fisherman, anyone who enjoys gorgeous waterviews, sunsets, nature walks, biking and beaches. It is also a perfect for location for overnights before/after weddings or other special events on Long Beach Island. For the price of a hotel room, you have access to an entire house as well as beautiful outdoor space. * Sorry but we do not rent our home to anyone under the age of 25. This is a quiet, pristine neighborhood. Most appreciative. However, I do not want my comments published. We did enjoy the two days together, despite the fact that Friday was an absolutely miserable day. Saturday dawned a little brighter and a little sunnier. Your home is beautiful and the location great. I do have a suggestion, however, if you don't mind. Since we have stayed at other facilities in the past we always found alist of help aids for what is needed, e.g, what temperature should the thermostat be left at; what do we do with the linens and towels used; do we leave the garbage in the bins in the front of the house, etc. We did what we usually did at other places - left the linens on the washing machine; did put the garbage in the bin hoping that was the right thing to do since we didn't know the garbage pick-up schedule and left the thermostat at 60 degrees. I apologize if this is not what you expected. One small thing you should look into. We found ants on the kitchen counter with no food in sight. They might be coming in from an opening somewhere. And they were only on the counter. I should have begun by thanking you again for allowing us to stay a little longer on Saturday. We left by noon for a few had never been to Smithville Village so since the weather was so nice we spent a little time there. Our evening prayer and Saturday morning prayer ended our day and began another together. Again, thank you and blessings on you and your family andon all the guests that will use your home in the future. Great place. Perfect Setting. Great atmosphere. The property was exactly what was described on the VRBO site. My family was very pleased with the rental on 104 Catherine Lane in Stafford Township. The unit was clean and contained the amenities that were described. I would recommend this unit to others who are looking for a place off of LBI but still close enough to go to LBI or Atlantic City. Ken Nuzzi was very responsive with all my questions before the visit and when we first arrived. We arrived on Friday evening for a 4 night stay - and were dismayed to find the house at a temperature of 98 degrees. After alerting Kenneth, opening the windows and purchasing fans from the local Lowe’s, the temperature barely went down to 88. Over the next few days, the outdoor temperature dropped so open windows was bearable despite the high humidity, but on the 3rd day, the outdoor temperature increased again so the indoor temperature became stiflingly hot and unbearable, especially for our two young children so we had to leave a day early. We informed Kenneth that the AC was not working throughout the stay. We reached out to let Kenneth know we had to depart a day early - and he assured us that he would provide a refund, which he never followed up on. 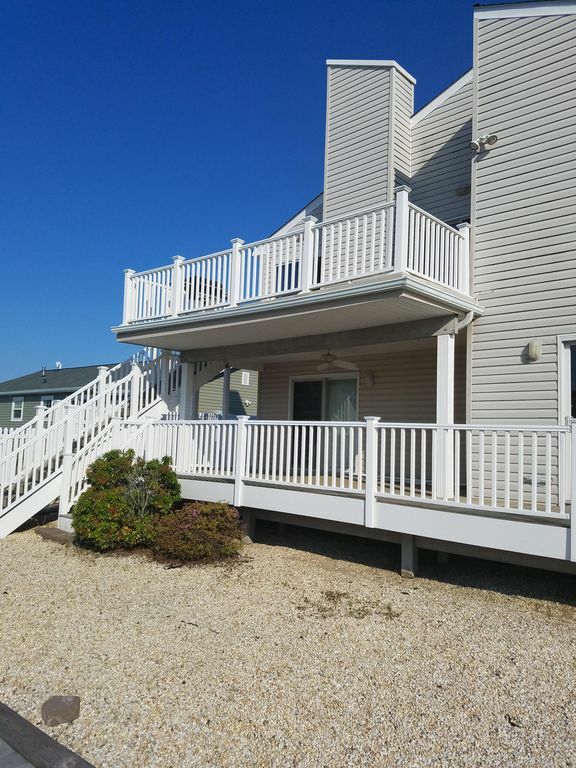 Overall, the property is in a great location outside of LBI, but very sparsely furnished. Very clean, beautiful home with awesome amenities. Very comfortable and accommodating. My wife and boys had a great time. The house was beautiful, lots of amenities, very comfortable and accommodating. Lots of space for family time, and plenty of spots for one while reading a book. The owner was excellent, quick with responses to questions, and we said we can’t wait until we return. Excellent time!! !